Seth is the master of pointing his finger at broken systems. In Linchpin he finally pleas to you to step out of this broken box. Actually he goes so far to suggest that’s almost a survival strategy to do so. You are probably guessing how the economy will perform this year, how secure your job really is, or if your potential customers will have any money left to pay for your services, aren’t you. The rug is pulled away under your feet, it’s time to take matters and responsibility back in your hands. 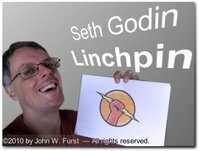 Seth Godin motivates you to become a linchpin in your organization. In the old days a linchpin was essential to fasten and secure a wheel to the axle. In our days and age you only will be indispensable, if you have become a linchpin. Doing your job—even if you do a great job—isn’t good enough anymore. Forget job security or the concept of a loyal customer. One key concept for becoming a linchpin is creating exceptional, outstanding value for your boss, share holders, customers, whoever, … by exerting emotional labor. (↑) This creative process and its output will become your differentiator. This is the most difficult part. That’s where the value is, the source which will make you indispensable. As the sociologist Arlie Hochschild has described forty years ago, emotional labor is done with your feelings, not with your body. It’s the part which cannot be substituted with the output of machines or cheap labor from the other side of the planet. As I understand the author creativity and human interactions are the main ingredients for value creation. This makes it almost a form of Art. While the author speaks to our inner artist, he points out Art is not limited to visual Art, performing Art or music. Why should creating a new business model or an efficient algorithm for software not be considered an art form? Now imagine you make that decision to change everything and start living your life on your terms, how would that feel? It’s risky—a bit—but the rewards will be worth it. Seth Godin, is the author of Tribes, Purple Cow, Permission Marketing, and many other international bestsellers that have changed the way business people think and act. He’s the most influential business blogger (↑) in the world, and consistently one of the twenty-five most widely read bloggers in any category. He’s also the founder and CEO of Squidoo (a successful internet company) and a very popular lecturer. So far I only have read a 62 page summary written by Seth Godin, sent to me by Seth Godin early this week. His writing style is very enjoyable and resembles the beauty of elegant mathematical equations: You don’t get tired of playing with them and, yet, always find new applications and solutions. I am certainly very curious about the rest of the book. Seth does not want to write books for everyone—and he admits it—but once he has the reader on his hook … Game over. You’re a fan. Maybe some notes of warning! Don’t expect it to be easy to change. It’s not. It might help to give copies of the book to your spouse, friends, your boss so that they better understand what you are trying to become and understand it’s also for their benefit. I learned this from Alex Mandossian. He always suggests to get at least 3 copies of any book he recommends. Being generous is another important trait of linchpins. Speaking of generosity, Seth was so nice to answer two questions about the book. So we shot some emails on a trans-atlantic mission. Here we go. Q: Can you imagine a story that if you hear it you would say about, “If only that had happened because of my book, it would have been enough reason to do all this work and write this book.” What would that story be? A: I’ve already discovered everything I was hoping for… people are telling me that the book has given them the last push they needed to do something important, something worthy of their effort. That’s the whole point! A writer and photographer with passion. P.S. : I know the book will not be released before the 26th. Why not order it from Amazon and also subscribe to Seth Godin's blog (↑). 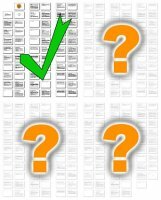 This post was mentioned on Reddit by marvin566: Book review and questions answered by the author. Sounds like an interesting book. Do you think it would be of help to self-employed people as well? Good to see you're back. I also noticed your new 'personal development 'blog. Great. Sure, the self-employed can benefit from Linchpin a lot, too. Many small business owners are caught in a box as many employees are. A business owner can step out of the box even easier. They have more freedom over their lives already. But that's just my humble opinion. Watch Seth's blog. Again, there will be a surprise coming up soon. Something related to the book of course. Thanks for including Q&A from Seth. That's another thing I've learned from him, he responds. He probably has thousands of relationships that are easily managed by periodic 'few word' emails. I guess that kind of makes him a linchpin. What else would he be? Thanks for taking the time to leave a comment. I have fixed your link. Seth Godin is certainly a very special individual, indeed. I am glad to know and can learn from him.